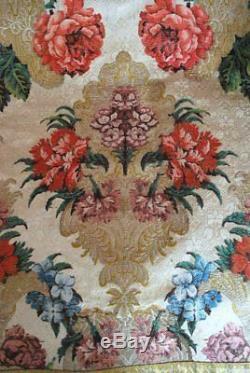 Extravagant 18thc silk brocade lampas pieced fragment, probably furnishing silk and looks French to me. Well matched center seam and probably assembled in the 19thc with beautiful coral colored backing and gold metallic gimp edge. Technically amazing woven textile with gold tinsel and brocaded silvery white ground. The colors still vibrant with beautiful shading on the flowers. The pieces measures 41" by 40". KEEP IN MIND ANTIQUE AND VINTAGE ITEMS DO NOT HAVE SIZE/FABRIC CONTENT LABELS. CONDITION DESCRIPTION IN ALL LISTINGS. PLEASE ASK ALL QUESTIONS BEFORE BECAUSE ALL SALES ARE FINAL! The item "18THC FRENCH OR CONTINENTAL SILK BROCADE LAMPAS EXTRAVAGANT FLORAL & FOLIAGE" is in sale since Friday, January 19, 2018. This item is in the category "Antiques\Linens & Textiles (Pre-1930)\Fabric\Silk". The seller is "heartnsoul1" and is located in Hollis, New Hampshire. This item can be shipped worldwide.